I know Jake and the Neverland Pirates has been around for a little while, but Asher has just recently discovered the show. It was the perfect theme for his 5th birthday party last month (and easier for me to come up with party ideas than his original “Monster Truck” plan) So even while reeling over the fact that my baby was going to be 5, I put together a few fun games and activities for our pirate party. 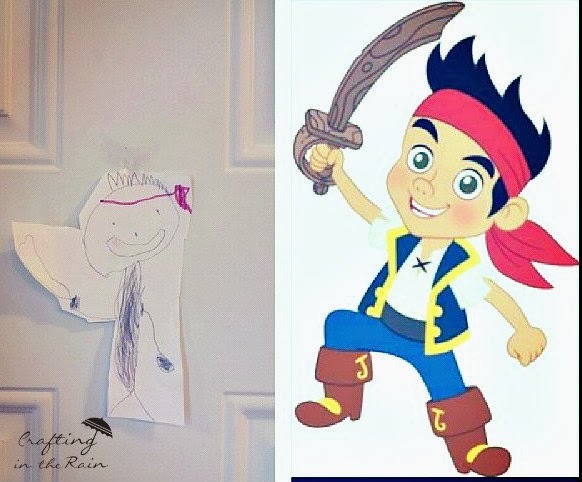 He even helped draw this cute little Jake for our door! 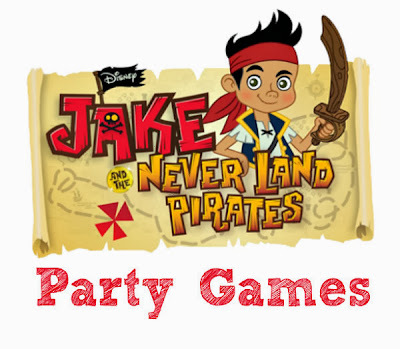 As soon as all the guests arrived, we started up an episode of Jake and the Neverland Pirates to watch and everyone got a little baggie of Pirate’s Booty to eat and a small water bottle with a pirate wrapper from How to Nest for Less. After the show was done, the kids all went to the living room to look for Gold Doubloons (chocolate gold coins of course) that I’d hidden all over. I told them they each had 6 hiding, so when they found their 6, they had to help the other kids find theirs. This kept us from having to “redistribute” afterwards, and they had fun helping each other too! Their bags were just made from folded and taped red and white striped paper. I added pirate tattoos and Jake and the Neverland Pirate fruit snacks before they took them home too. 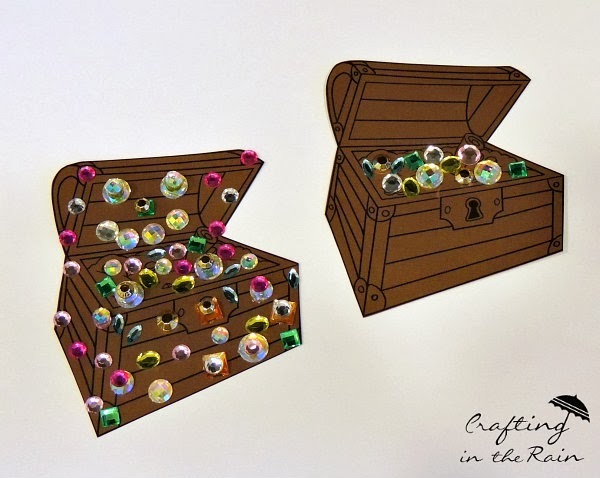 I printed out little treasure chests on brown paper, cut them out, and each child got to decorate it with sticky gems I’d picked up from the craft store. They actually turned out really pretty! 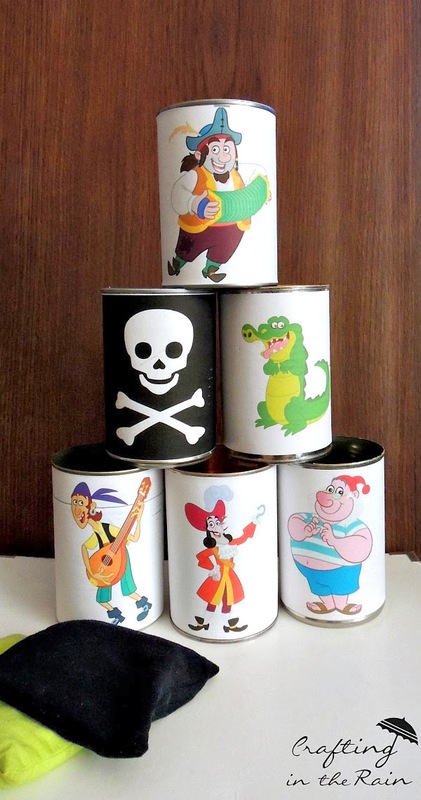 I found some cartoon pictures of pirates and printed them out to tape onto some clean empty cans. Everyone got turns to throw bean bags at the tower of cans to knock them over. 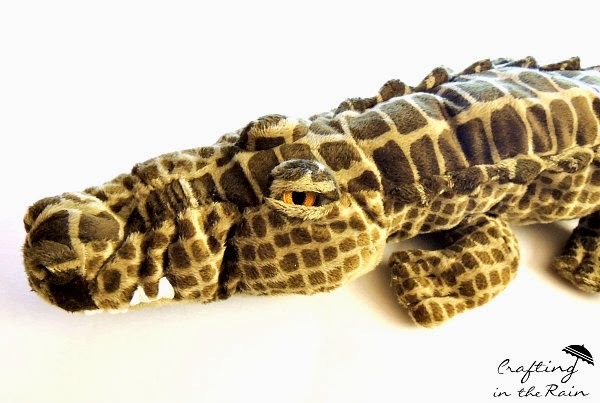 The best part of this game was the stuffed crocodile I found at IKEA. He was just $10 so he had to come home with me! Each person took a turn for leaving the room while the other party guests hid the crocodile somewhere in the room. We called them back in, and after they looked around for about a minute, we started saying “tick-tock tick-tock” louder or softer if they were closer or farther away from the toy (like telling someone they’re hot or cold) This one was definitely a party favorite! Mixed throughout the activities we also ate chocolate cupcakes with a paper pirate flag on a toothpick, and opened presents. 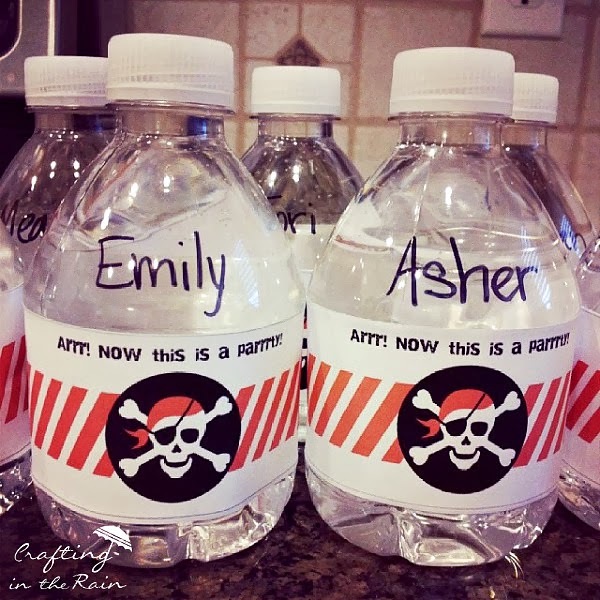 I hope this gave you some fun ideas for your own pirate party!! 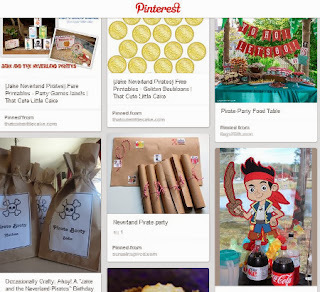 For more pirate party ideas, be sure to follow my Parties pin board.